Put the cream in a bowl and warm it a little bit at least 2 minutes. Add rafhan jelly then mix it very well in the cream. 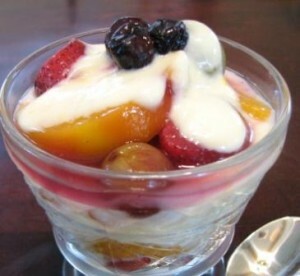 Seperate the fruit from its syrup and add it into the cream. Then leave it into the freezer for half an hour. It is ready to serve.